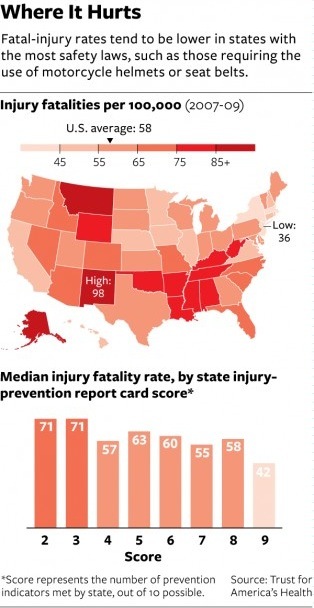 National Journal (a great national publication widely read by insiders of both parties in DC) had an interesting little article (“Nanny State Works, When It Comes to Injuries“) on the relationship between state safety laws and injury fatalities. Americans love to complain about rules: federal rules, state laws, local building codes, etc. However, I think we should admit when those work. Whenever I see an earthquake or hurricane completely devastate buildings in other nations, I think that some of those annoying building codes might just work.